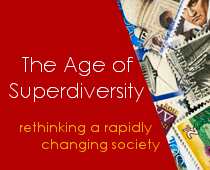 The Institute for Research into Superdiversity (IRiS) at the University of Birmingham is organising the second international interdisciplinary conference on superdiversity. The aim of the conference is to map the state of the art in knowledge on superdiversity and reflect on the analytical and heuristic uses of the concept, its potential and limits. The Call for Papers and Panels is now open. Deadline for submission: 15 January 2016.